It’s a trend that can’t stopped – the entrepreneurial spirit has become viral in nations around the planet – and it’s only the beginning. Widespread social, economic and technological changes have inspired the entrepreneur within millions of people globally. In this version of Businesses with Bang!, we take a look at how ProFounder, an online fundraising platform for entrepreneurs, is ready to take this trend to a whole new level. Back in August, we talked about “The Promise of Microfinance for Entrepreneurs,” and how it was only a matter of time before microfinance/crowdfunding models would be created to meet the fundraising needs of North American entrepreneurs. Our biggest question at the time was not if, but when would we see the new trend reach its tipping point and allow entrepreneurs to raise capital using the microfinance model online. Well, ProFounder provided us with an answer and it’s a lot sooner than we could have imagined. ProFounder is an online platform that helps US-based entrepreneurs raise capital (up to a million dollars) using the crowdfunding model. The company’s founders have ingeniously created a system to navigate US Securities Laws to allow startups to raise mone publically or privately on the platform. Investors from all over the world have the ability to get a piece of the startup pie by investing small amounts of capital in ventures of all different varieties. The beauty of ProFounder is that you, Joe, the everyday unaccredited investor, can get into the startup scene with just a few clicks of the mouse. What ProFounder wants is “ a world in which all people are empowered to pursue their dreams through entrepreneurship.” By democratizing funding, they are removing a huge barrier for many entrepreneurs and enabling them to launch in a much shorter period of time. So who are the architects behind the ProFounder platform? Dana Mauriello, an entrepreneur with a diverse background, came together to form ProFounder. Jessica left Kiva in 2009 to set the wheels for ProFounder in motion and now the duo have developed a platform that they hope will spark a whole new breed of entrepreneurs across the US – entrepreneurs who have the crowd behind their backs. Why are they so confident that the time is ripe for ProFounder? 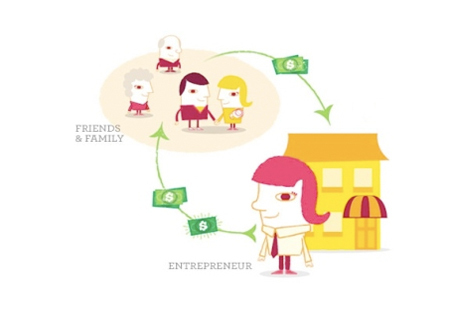 It is estimated that about 87%, or $144 billion dollars, of capital raised for new ventures is from friends and family. That’s a staggering amount of money. When you consider how chaotic and challenging it can be to get money from friends and family, it starts to become apparent that a platform like ProFounder can make a real impact. There are also millions of people on the sidelines who would love to kick in a few dollars to help a startup, yet have nobody to invest in. With an efficient, transparent platform in place, the odds of a promising new company raising funds increases exponentially. If you’re an entrepreneur, what do you need to get onto the ProFounder platform? Go to ProFounder’s page for Entrepreneur and follow the steps. Basically, all you need to do is create a legally compliant pitch and you can begin rounding up investors right away. You have the option to do either a public or private raise. To do a private raise, it is essentially the same thing as asking friends and family for money, and therefore anyone who has a substantial, pre-existing relationship (legal speak) with you may buy an equity stake in the company. A public raise, on the other hand, is open to any investor around the world. The kicker, however, is that public investors don’t get shares in the company, only a percentage of the revenues up to their original investment (the profits go to a charity of your choice). If you are doing a public raise, there is a $1,000 flat fee to use the platform, while if you do a private raise, there is no upfront fee, only a 5% commission if you are successful in raising capital. If you’re thinking about using ProFounder, there are already examples to inspire your confidence in the power of the platform. Despite only being launched a couple of months ago, ProFounder has already helped four companies successfully get financed: Uncle Clay’s House of Pure Aloha, Prosperity Candle, Bucket Feet and Proud Mary. I’m guessing that there will be many more to come in the future. Overall, ProFounder is helping inspire a whole new generation of businesses that never could have got off the ground previously. The company has already gained a lot of momentum coming out of the gates and it won’t be long before the word really gets out. In fact, one of the founders indicated that they will be doing their second fundraising round using the ProFounder platform in the near future, meaning that you and I could have an opportunity to invest in the future of startup financing – here’s to hoping for the ProFounder IPO.